Nanning and its surrounding attractions is a world of wonders. Detian Falls on the China/Vietnam border is stunning. 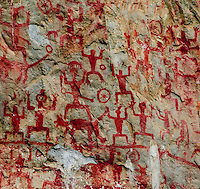 The ancient Huashan rock paintings mysterious. Qingshan Mountain are the green lungs of Nanning, while the Guangxi Herb Botanical Garden is the largest of its kind in Asia.